Irvine Truck Accident Injury Attorney - Over 40 Years of Experience You Can Trust! Were You Injured in a Truck Accident or Car Accident in Irvine? 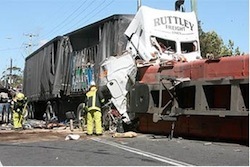 There were 7,249 truck collision injuries in 2011 of which 278 people were killed. In Orange County alone there were 442 people injured in 2011 from truck collisions. Our Irvine truck accident injury lawyers and law firm provide expert personal injury legal services for those injured in truck collisions, including accidents with big rig trucks known as 18 wheelers, and for the relatives and families of those killed in truck and other fatal accidents for wrongful death claims in Irvine, a city located in Orange County, California. If you or anyone you know had a truck accident or other personal injury claim in Irvine, Lake Forest, Los Angeles, or anywhere else in California, please contact our truck accident injury attorneys and law office now for a completely FREE CONSULTATION. For additional helpful information about truck accident injury claims, please visit our Truck Accident Web Site. Irvine is a suburban city that sits in between Anaheim to its north, making it minutes away from Disneyland, and Newport Beach and Laguna Beach to the south, where people can enjoy a scenic view of the Pacific Ocean. According to the 2010 U.S. Census, the city has a population of 212,375 people. Immediate help with medical care, specialists, property damage repair and settlement, medications, prescriptions, advances, etc. One serious injury that victims of truck accidents experience is spinal cord injury. The spinal cord is a nervous tissue that extends from the brain, is the main pathway for information, and combined with the brain makes up the central nervous system. The spinal cord is injured from damage to the nerves or the cord itself caused by lateral bending, rotation or hyperextension of the cord. If you or someone you care about sustained any spinal cord injury from any truck accident or other personal injury accident in Irvine, Mission Viejo, Los Angeles or anywhere in California, please contact us now, including for referrals to doctors who may provide treatment without requesting any payment until the claim is resolved. The Law Offices of Gary K. Walch provides you with the strong advocacy that you need when you or a loved one has been through a devastating truck accident or other injury accident in Irvine or anywhere in California. It is our job to best represent your interests and aggressively pursue your rights. Our staff handles accidents involving car, motorcycle, truck, bus, train, bicycle, pedestrian, hit and run, uninsured motorist (UM) and much more. Call us now for an absolutely FREE consultation to review and analyze your personal injury case. For your convenience you don’t even need to leave the comfort of your own home. Just like many of our clients you can do everything by telephone at 818-222-3400 or toll free 866 INJURY 2 (465879 2), email (info@WalchLaw.com) or simply complete our very easy to use contact form.